Getting feedback concerning this website is always nice and has been the main motivator in updating and adding more stuff here. Informing me of factual errors, typing mistakes and broken links is also welcomed. However I ask you not to e-mail asking for travel advice for your own trip to Japan. My suggestions are all within these travelogues and these days I haven't got the extra time to consult each one individually. You can contact me by e-mailing (you can find it at the bottom of each page). There used to be a guest book too, but it wasn't worked for a long time now (it won't take new posts), so I removed it from the top menu for the time being. You can still view it here if you like. 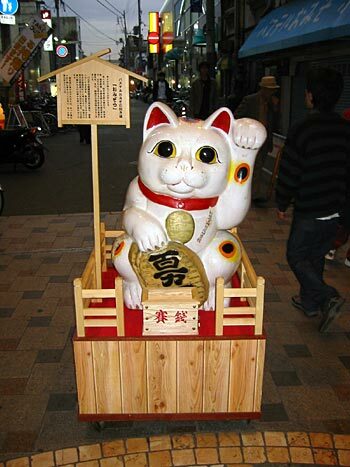 It's a Maneko-neko. His left pawn is raised to attract people (and their money). A common luck charm at hotels and restaurants.